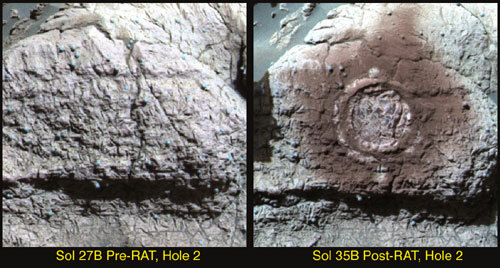 This image from the Mars Exploration Rover Opportunity's panoramic camera shows the results of the second drilling by the rock abrasion tool, located on the rover's instrument deployment device, or "arm." The drilling took place on a target called "Guadalupe" within the "El Capitan" region of the Meridiani Planum, Mars, rock outcrop. As with the first rock abrasion tool target called "McKittrick," the grinding process at "Guadalupe" has generated a significant amount of fine-grained, reddish dust. Color and spectral properties of the dust show that it may contain some fine-grained crystalline red hematite. This image is an enhanced color composite generated from three different panoramic camera filters.